It's better to give your bicycle new teeth than to need them yourself. 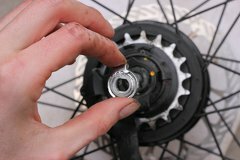 The Shimano Alfine Inter 11 internal gear hub has a sprocket which transfers power from the chain to the hub. The sprocket wears out over time from the chain rubbing over the teeth. 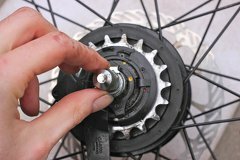 This article is meant for owners of a bicycle with a Shimano Alfine 11 internal gear hub who want to replace the sprocket for the first time. This procedure is relatively simple and does not require any special tools. A worn out sprocket will cause the chain to wear faster (and the other way around). 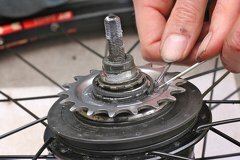 As a guideline you should replace the sprocket for every three chains you use. 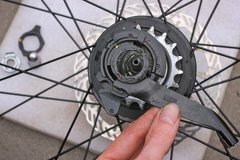 A new sprocket should cost less than 5 euro/US dollar. 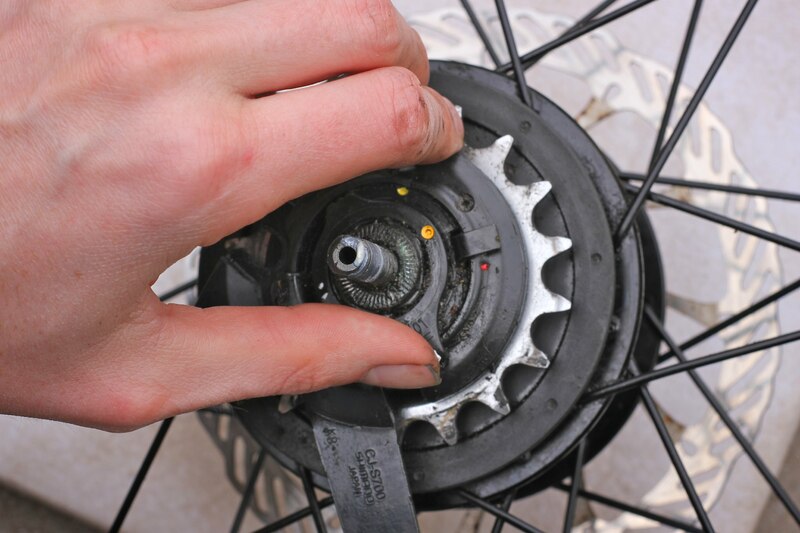 Another reason to replace the sprocket is to change the gearing of your bicycle. A sprocket with more teeth will lower the gearing, making it easier to climb steep inclines. A sprocket with less teeth will increase the gearing, making it possible to go faster. 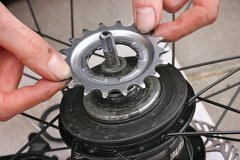 Shimano recommends a ratio of "around" 1.9 for the teeth, which means that there should be about 1.9 times more teeth on the front chain ring as there are teeth in the rear sprocket. However, many riders consider this to be quite high. In the lowest gear it is quite difficult to climb hills. Mountain bikers and cycling tourists use a lower ratio to climb hills more easily. This will allow you to put more torque on the hub which is why Shimano does not recommend it. 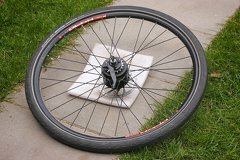 Although many people have used lower ratios for years without issue, a strong and heavy person who is pounding the pedals hard can more easily damage the hub. If you are replacing the sprocket with a larger one you may also need a longer chain. So it is makes sense to replace the sprocket and chain at the same time. If you are using a belt drive instead of a chain the same principles about gear ratios apply. Shimano sells Alfine specific sprockets. These sprockets have a plastic chain guard around them. The Alfine sprocket (S500) comes in only 18 or 20 teeth, and has a plastic chain guard around it. Shimano recommends using this sprocket when using the CT-S500 chain tensioner, which you would only need if your frame has vertical drop outs. The chain guard makes these sprockets more expensive and heavier. If don't need a chain tensioner Shimano Nexus sprockets will work equally well and are usually cheaper. There are even cheaper unbranded sprockets which will also fit. They may be made out of softer steel and wear out faster, or have less corrosion resistance. Sprockets come with 16, 18, 19, 20, 21, 22 or 23 teeth. They will all fit on the Alfine 11. Sprockets are usually dished, meaning you can adjust the chainline by flipping them around. There are black and silver colored sprockets. KMC sells some extra strong sprockets meant for electric assisted bicycles. Practically all sprockets sold nowadays are of the narrow type, meaning a narrow 3/32" chain will fit on them. 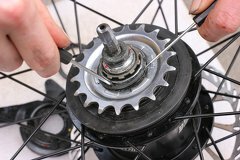 Bicycle with Shimano Alfine 11 gear hub installed in rear wheel. 28" wheel laying down on a piece of foam. 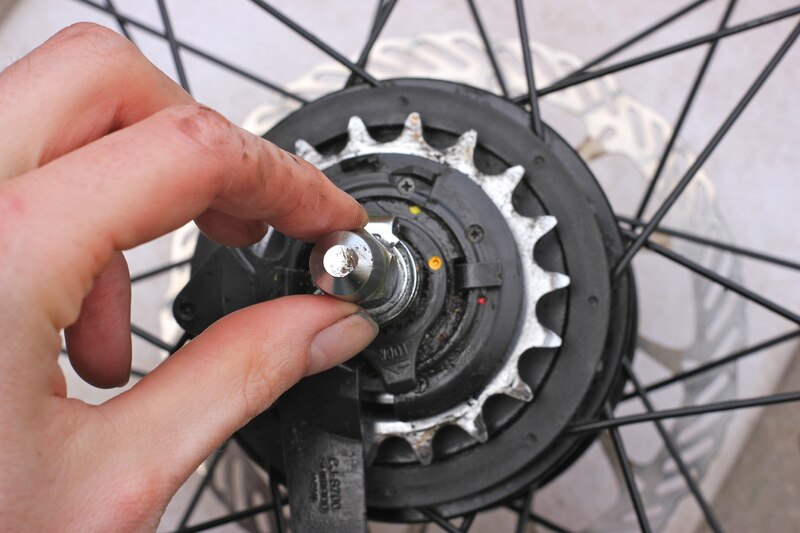 Loosen the axle nuts with a 15 mm wrench, disconnect the shifting cable, pull out the wheel and lay it down on its left side. Preferably on something soft to prevent it from being scratched. 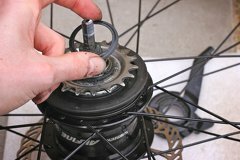 Remove the axle nut, since it is already loose, you can do it by hand. Removing the anti rotation washer. Remove the anti rotation washer, it should slide right off. No tools needed. The cassette joint lock ring has the word "Lock" on it with an arrow next to it. When it is locked (it should be when its on your bicycle) the yellow dots line up. Twist it the other way to unlock it and pull it off. The cassette joint can be taken off by hand now. The dust cap has a top and bottom. Take of the dust cap, note the orientation, you will need to put it back later the same way. The widest part goes towards the hub. Prying off the snap ring. Now the easy part is over. The sprocket is held in place by a metal snap ring which is snapped inside a groove. You need to lift it from the groove. There are three indents. Put a small flathead screwdriver in an indent near the snap ring's opening to push it outward. Use another screw driver to pry underneath the snap ring and push one end over the edge and work your way around it. It is good to have the wheel secured for this, I used my knees to hold down the rim. The snap ring is almost coming off. The snap ring is quite strong but be careful with applying to much force as it is easy to slide of and scratch, or stab yourself. When you give the final push the snap ring may jump up, so watch your face. This is a finicky job and even experienced mechanics may struggle for a while, just keep trying until you get a feel for it. Taking of the 18T sprocket. After the snap ring you can now take of the sprocket. Your bicycle may also have one or more washers with the sprocket to align the chain with the chain ring. Wiping off oil and grime. This step is optional. 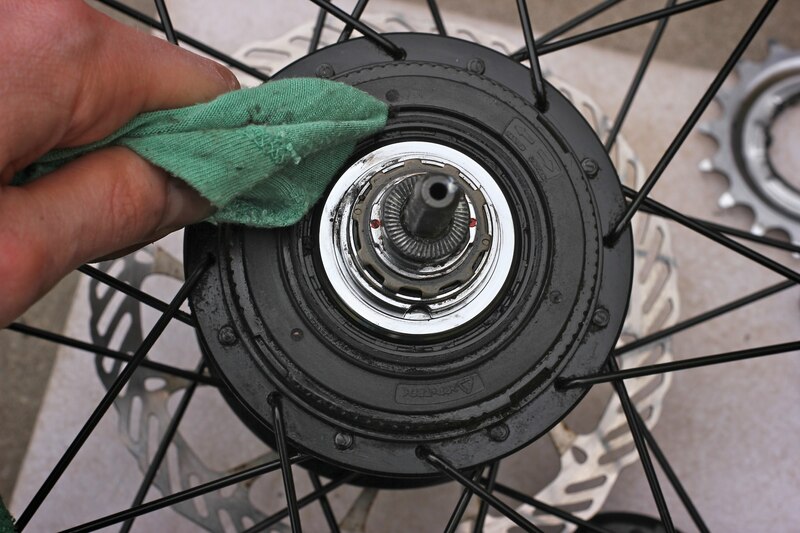 Behind the sprocket there is an aluminum seal cap that you can lift off, take a moment wipe away dirt that has accumulated. After putting on a different sprocket, put the parts back together in reverse order. The snap ring is also the most difficult part to get on. The other parts don't require any tools. Note the yellow and red markings on the cassette joint to ensure you are putting it back together correctly.